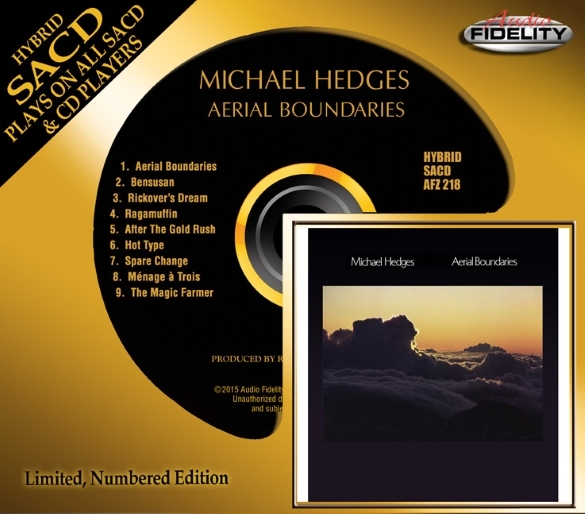 Camarillo, CA – Marshall Blonstein’s Audio Fidelity will be releasing guitar innovator Michael Hedges critically acclaimed album Aerial Boundaries on a limited edition hybrid SACD! This will be the first time that the celebrated album has been made available on the SACD format. It is important to note the “hybrid” SACD is compatible with all standard CD players and no special audio equipment is needed to enjoy the brilliant, remastered sound of unquestionably one of the most groundbreaking albums in acoustic guitar history. Aerial Boundaries is the record that presented Michael Hedges to the world as the ultimate acoustic guitar visionary, stretching the limits of the instrument to accommodate his uncanny musical ideas. There are moments on the record where it seems impossible that so much music is coming from one man and his guitar. The liner notes inside the SACD booklet assures the listener that the guitar is the origin for every sound heard…attacking his instrument, snapping strings, banging on the fingerboard with his right hand. The songs on Aerial Boundaries are all beautiful and haunting and it is this emphasis on composition over technique that makes this such an important recording. Hedges’ tracks feature layer upon layer of musical complexity and every performance expands the dynamic range of the instrument. Stirring, complex compositions like “Rickover’s Dream,” “Spare Change,” and an ingenious instrumental take of Neil Young’s “After the Gold Rush” are on full display. Hedges could be seductively quiet and suddenly explosive…slow or fast, timid or thunderous. “There was simply no one like him,” Bonnie Raitt said of Michael Hedges following his untimely death in 1997, “a very gifted performer, arranger and composer whose music sounded like nothing that had come before it.” Aerial Boundaries remains the late composer-guitarist’s seminal work, and its innovations in technique, tuning, tone, and intensity remain key texts in modern acoustic circles. Hedges electronically manipulated some of the guitar sounds to an almost unrecognizable point and still managed to create music of untarnished beauty and so very rich in classical harmony. Aerial Boundaries is also available from Audio Fidelity on a deluxe 180g high quality vinyl pressing.